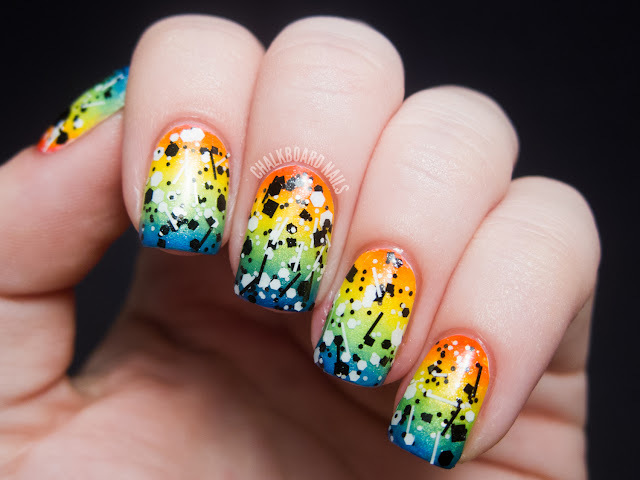 This manicure was done by sponging five colors on top of a dry white base. 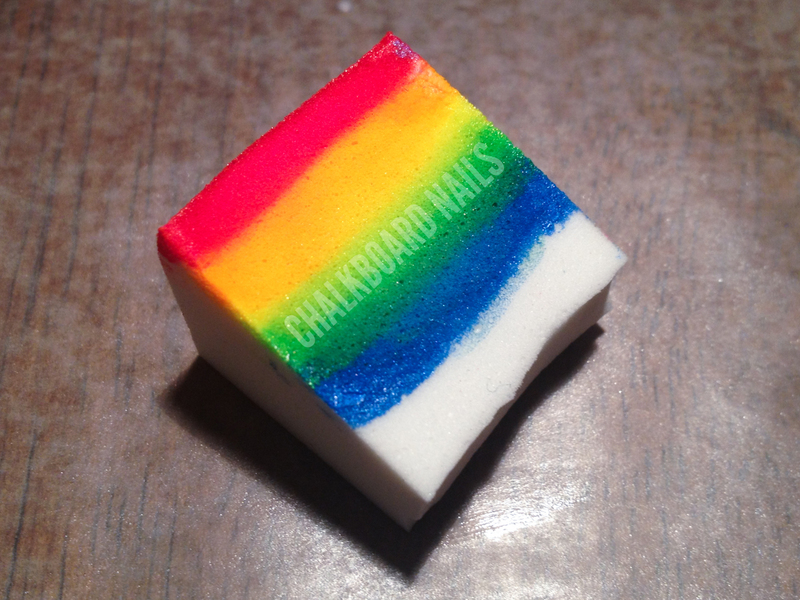 Check out the end of this post for a look at what the sponge I used looks like. The colors I used are China Glaze Rose Among Thorns, China Glaze Sun Worshipper, China Glaze Sun-kissed, China Glaze I'm With the Lifeguard, and China Glaze Splish Splash. 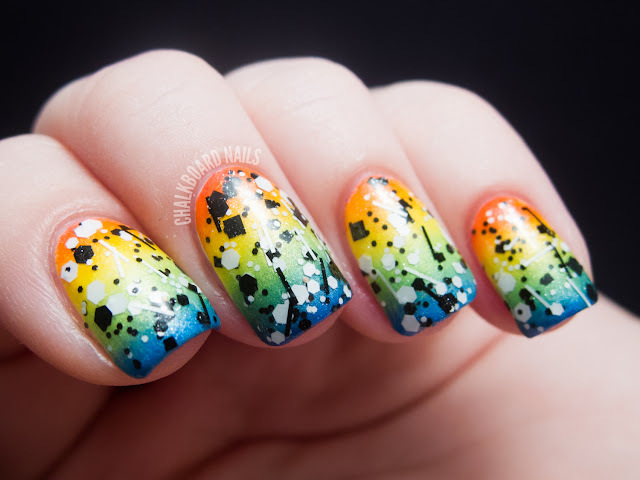 I had to sponge each of the nails a couple of times to get the pigmentation of the neons that I was looking for. Then, I topped the whole manicure with Lynnderella Connect the Dots. I originally started off this manicure with a purple in it, as well, but my nails just weren't long enough and the purple never made it on. I don't think it matters though, I love the way these look and are definitely rainbow-y enough for me! 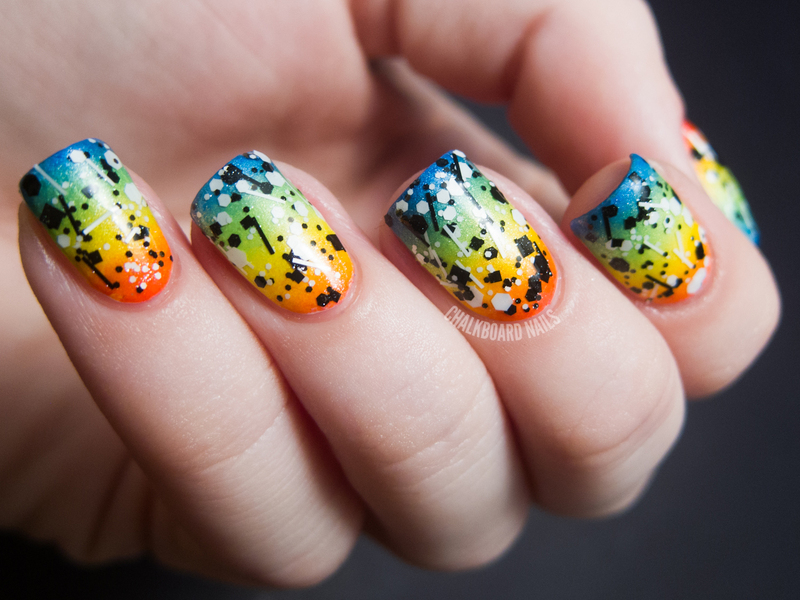 These nails remind me of the neon rainbow gradient nails from Amber Did It. Make sure to check hers out, they're great! Since there were so many colors in the sponging this time, I decided to try the "paint directly on the sponge" method instead of the "paint on wax paper and pick it up with a sponge" method. It worked out really well! I'm not sure which method I prefer. I'll probably continue to paint on the wax paper for two color gradients and paint directly on the sponge for more complex gradients like this one. Here is the gradient alone, before I added the black and white glitter. 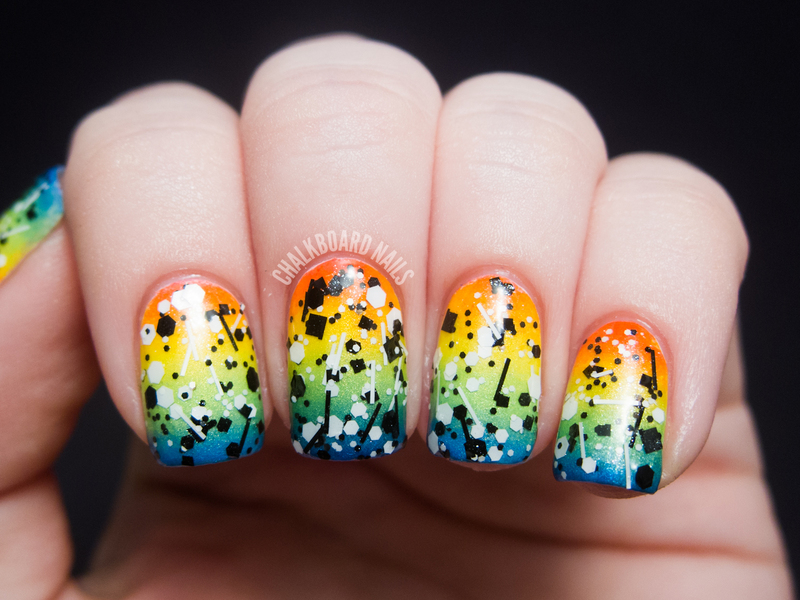 Last year's rainbow manicure was rainbow "half moons" with cloud french tips! The 31 Day Challenge challenge prompts can be found here. This is so pretty! 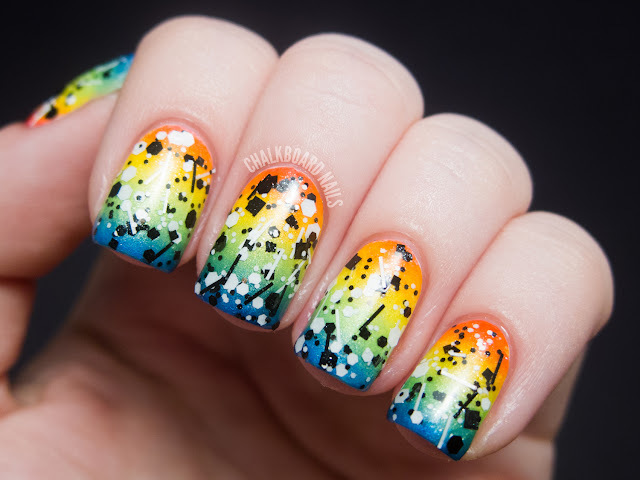 That's my favorite way to get a gradient, especially with a lot of colors like that! this is so fun and pretty! definitely full of pizzazz! Your gradient skills are amazing !! Some people use a damp sponge. I use mine dry. The key is to have a dry base color and to use the sponge gently. You will probably have to go over the sponging a few times for pigmentation. Many thanks! I was probably not gentle enough & didn't know how many times I'd need to go over it. Appreciate your answer! This is actually stunning. I have never done successful sponging before today (it is actually my entry for your contest, haha) but I use a damp sponge. Wow, that is AWESOME! The gradient is stunning on its own!! I love the addition of "Connect the Dots." 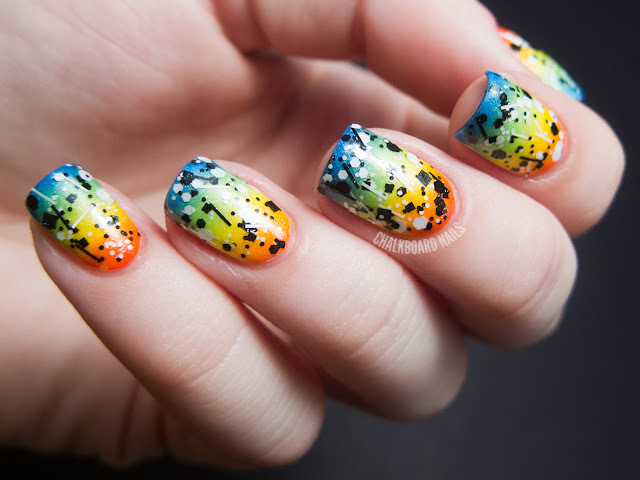 I've seen a lot of B&W glitters making appearances on rainbow nails and it really makes me want one even more! Yep, a rainbow mani is always a happy one. Now I'll have to do a rainbow mani soon and then stamp over it. Your last pic is just begging for stamping to my eyes. 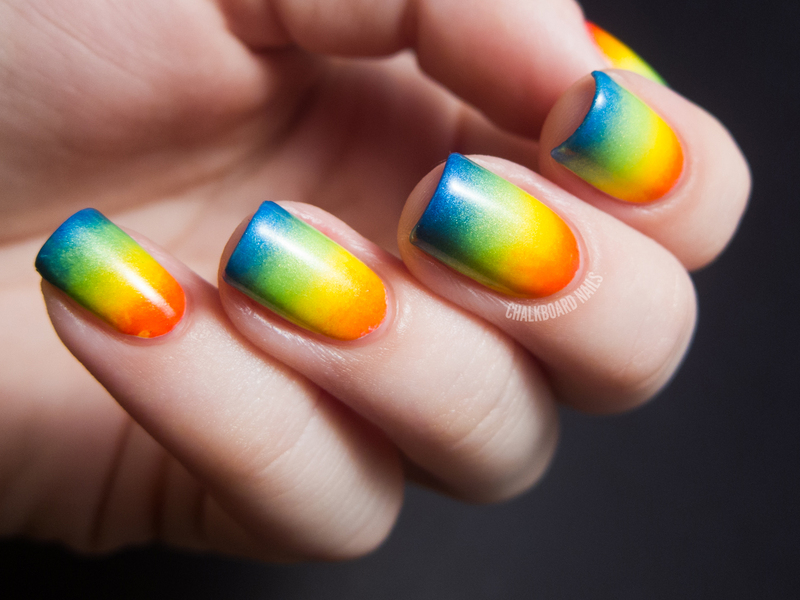 The gradient is SO perfect <3 it looks airbrushed! Love it! Very pretty! I'm also feeling the love of bold glitters over gradients! I did a coral and lavender gradient with Lush Lacquer's Salt n' Peppa over it and I loved the look... this one is SO colourful I can't stop staring! When I saw this on instagram I died! I just had to come over here and say how awesome this is! Hey, this is a really lovely manicure, love it! Can I just ask, this may sound like a silly question but the line around your cuticles is so nice and neat. How do you achieve this? I try to clean up with a cotton bud dipped in remover but I can never get my cuticles looking as neat as yours which makes my pictures look rubbish :-( well done on a fabulous rainbow mani! Thanks. Try using a small makeup brush instead of a Qtip. That will allow for a much more precise edge. 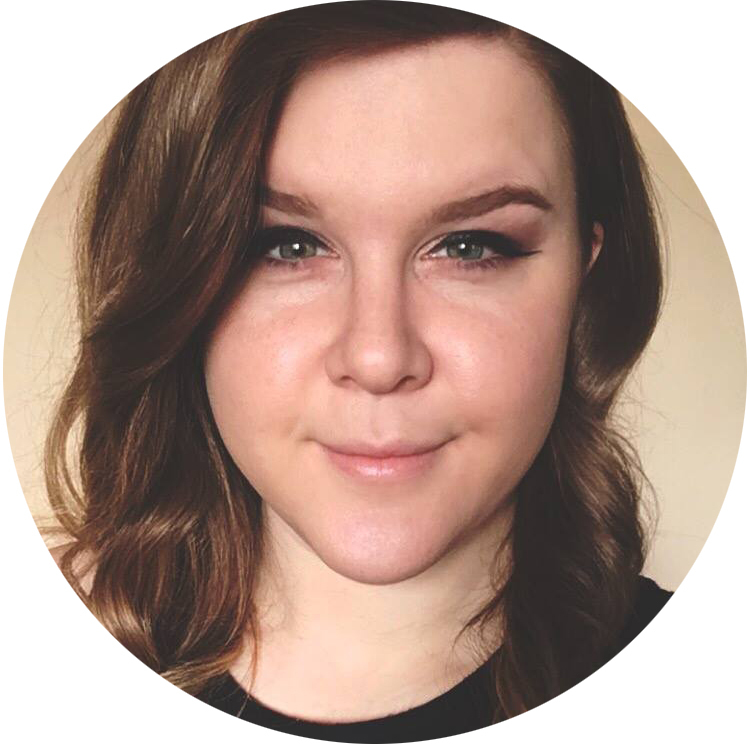 You can check out my FAQ page for some helpful links. Wonderful combination!!! I love that degradé. Stunning! I actually prefer it before glitter, but it does look fab after as well. o wow! These look awesome! I love the gradient underneath! adds so much dimension and beauty! I love the gradient alone. This is one the best rainbow gradients I've ever seen!!! I believe this mani should be named Pizazz. Brilliant Idea! I may have to try this method out myself! You just use regular nail polish? It will come right off the sponge like that? Yep you use regular polish! You will have to do a few rounds of sponging to get the color nice and vibrant, though.